The Central Pacific Railroad wanted San Francisco’s help in constructing a bridge to span the southernmost tip of the Bay. Emperor Norton had a different idea. On 28 December 1871, the San Francisco Evening Bulletin ran an editorial (reprinted in the next morning’s Sacramento Daily Union) expressing the paper’s view of a recent proposal from the Central Pacific Railroad Company. The Railroad wanted to build a bridge spanning San Francisco Bay at its narrowest point — from Newark to Ravenswood (modern-day East Palo Alto) — and it wanted the people of San Francisco to underwrite a $3 million bond issue to pay for the job. We presume…that the people of San Francisco would cheerfully vote $3,000,000 in aid of a bridge across the bay that would lead directly into the city; that would be equally open to all railroads from the interior; that would provide a carriage and footway, and that would be sufficiently under municipal control to prevent abuses or monopoly…. It is extremely doubtful, however, if the city should consent to give $3,000,000 for a bridge so far down the lower bay as Ravenswood, distant about thirty miles from the corporate limits, and accommodating none of the northern railways, unless they made a horse-shoe curve forty or fifty miles long. Such a bridge would not certainly bring more than one railroad into the city which cannot enter it now without any bridge at all. 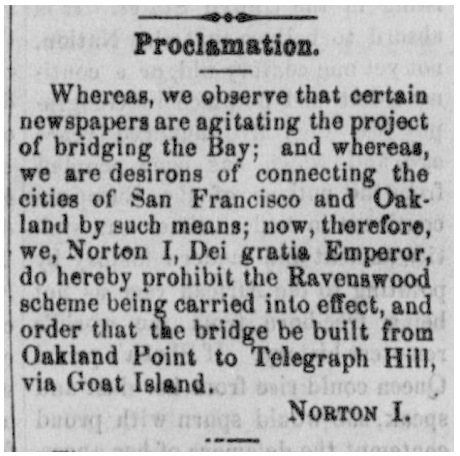 Whereas, we observe that certain newspapers are agitating the project of bridging the Bay; and whereas, we are desirons of connecting the cities of San Francisco and Oakland by such means; now, therefore, we, Norton I, Dei gratia Emperor, do hereby prohibit the Ravenswood scheme being carried into effect, and order that the bridge be built from Oakland Point to Telegraph Hill, via Goat Island. “Goat Island” is known today as Yerba Buena Island. I. That a suspension bridge be built from Oakland Point to Goat Island, and thence to Telegraph Hill; provided such bridge can be built without injury to the navigable waters of the Bay of San Francisco. III. That all deeds of lands by the Washington Government since the establishment of our Empire are hereby declared null and void unless our Imperial signature is first obtained thereto. Believing Oakland Point to be the proper and only point of communication from this* side of the Bay to San Francisco, we, Norton I, Dei gratia Emperor of the United States and Protector of Mexico, do hereby command the cities of Oakland and San Francisco to make an appropriation for paying the expense of a survey to determine the practicability of a tunnel under water; and if found practicable, that said tunnel be forthwith built for a railroad communication. * Note that the Emperor was staying in Brooklyn, Calif. — current-day East Oakland — when he issued this Proclamation. Whereas, we issued our decree, ordering the citizens of San Francisco and Oakland to appropriate funds for the survey of a suspension bridge from Oakland Point via Goat Island; also for a tunnel; and to ascertain which is the best project; and whereas, the said citizens have hitherto neglected to notice our said decree; and whereas, we are determined our authority shall be fully respected; now, therefore, we do hereby command the arrest, by the army, of both the Boards of City Fathers, if they persist in neglecting our decrees. The San Francisco-Oakland Bay Bridge opened on 12 November 1936 — sixty-four years after Emperor Norton set out the original vision for a bay-spanning suspension bridge linking Oakland and San Francisco via Goat Island (Yerba Buena Island). The Transbay Tube of the Bay Area Rapid Transit System (BART) opened on 16 September 1974 — one-hundred and two years after the Emperor set out the original vision for an underwater rail tunnel linking Oakland and San Francisco. The Emperor's Bridge Campaign currently is engaged in research for this important publishing project, launched in 2015 with a research grant from the San Francisco History Association. Learn more about the project — and donate to support it here.